From South America to Europe and Japan, jazz-fusion solo artist and pro-metal hero Kiko Loureiro has crafted a sound of his own. As guitarist for the progressive metal band Angra, Kiko derives his tone from a stunning combination of Brazilian Samba, Cuban, Latin and metal influences. 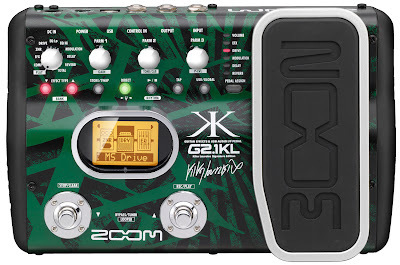 Now all of his sounds have been packed into his newest signature edition pedal, Zoom’s G2.1KL. G2.1KL, a significant upgrade from its G1K predecessor, features 50 patches created by Kiko, including Angra-style solo tones, clean acoustic sounds for Bossa Nova and Latin music, bluesy drive patches and many other sounds ranging from thick rhythms to sitar emulation. The pedal also offers 50 of Kiko’s favorite patches from Zoom’s popular G2.1Nu, as well as 100 user patches for creating and saving your own original sounds. G2.1KL was constructed with Kiko’s personal style and taste in mind. The pedal features custom designed body graphics created by Kiko. Its sturdy metal chassis allows G2.1KL to withstand the rigors of the road, yet it’s small enough to fit into a guitar case. Wherever you need it: on tour, in the studio or at rehearsals, G2.1KL is ready to go. 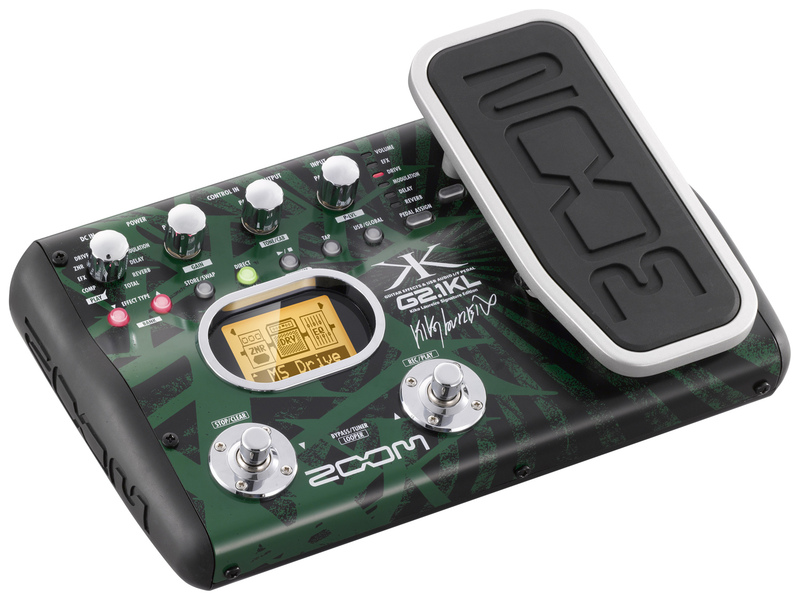 G2.1KL features a multi-purpose expression pedal. The pedal, with its PEDAL ASSIGN key, makes it easy to select the effect you want to control on any patch. Effect on/off switching is also possible by fully depressing the pedal. 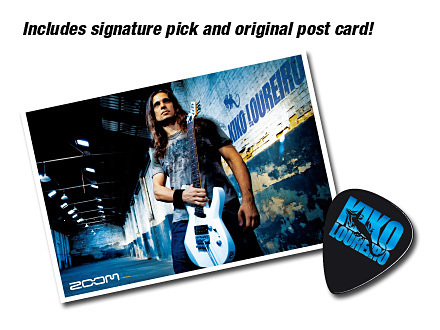 Every pedal comes with a Kiko Loureiro signature guitar pick and postcard. G2.1KL maintains the original features that made the G2.1Nu so popular: advanced ZFX-3 sound engine, 83 guitar effect types, on-board auto-chromatic tuner, integrated drum machine and more. To recreate the rich blend of upper frequency harmonics that are unique to tube amplifiers, you need a powerful processor. Thanks to its high-resolution signal processing using 96 kHz sampling and 24-bit A/D/A conversion, ZFX-3 implements complex digital modeling technology to recreate those subtle tube amp characteristics. You’ll never stay out of tune with G2.1KL. The pedal’s Tuner function offers smooth, real-time response with precise guitar tuning accuracy. In addition, its large 1.9-inch LCD display and LED indicators make it easy to use on a dark stage. Its mute tuning capability is also very useful during a performance. Choose from 40 different rhythm patterns, including 4-beat, 8-beat, 16-beat, shuffle and many other variations. Plus, the tap key makes it easy to directly set the tempo. Start a jam session anytime, anywhere. G2.1KL operates as an audio interface, letting you record directly to your computer via USB. All of your sound settings used during rehearsals or live performances can be recorded directly to your favorite DAW software. The pedal’s direct monitoring capability eliminates latency problems, assuring hassle-free tracking. The LCD display and a new, more intuitive interface allow easier navigation during both live and recording sessions. Zoom’s Edit & Share software comes bundled as a free download with G2.1KL. Edit & Share allows you to use your computer to create, edit and save your personalized amp and effect settings. Use the “radar charts” to access visual representations of the tone characteristics for each preset patch. Also, its amp/effect sorting feature helps you easily locate your sounds, as you need them. Using drag-and-drop to rearrange patches makes editing a breeze. With Edit & Share, you can download the latest patches online, as well as share patches with other users. Access the pedal’s 5-second Looper function to record, playback and overdub guitar phrases that can be controlled with your pedal. The “sound-on-sound” function lets you record phrases in real time. You can also use the looped sound as a backing track during a live solo. G2.1KL’s ultra-low noise design is on par with professional studio equipment. Specifications such as a signal-to-noise ratio of 120dB and noise floor of -100dBm virtually eliminate background noise. G2.1KL includes Zoom's proprietary ZNR noise reduction, which helps to remove feedback and other unwanted sounds introduced by the signal chain. Even the tails of sustained notes come out beautifully, with natural release. With G2.1KL’s amazing 5ms patch change speed, you will never miss a beat. Change from rhythm playing to a solo in an instant by simply pushing the switch. G2.1KL can operate on three different power sources: AC adaptor (included), batteries or USB bus power when plugged into your computer. Four AA/LR6 alkaline batteries provide over six hours of continuous playing. Whether on stage or in the studio, G2.1KL gives you reliable power options. G2.1KL is also bundled with Cubase LE 4 DAW for all your recording needs. This powerful music production system features recording, editing and mixing functions for both audio and MIDI files. It incorporates the same audio engine as the multi-award winning, higher-level version Cubase 4, and is ideal as an entry into computer-based music production. No matter where you go in the world, everyone will dig the sounds of your G2.1KL Kiko Loureiro Signature Edition Pedal.